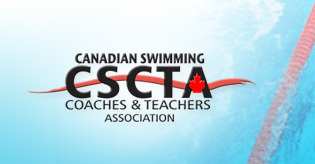 The Canadian Swimming Coaches and Teachers Association (CSCTA) is the professional organization for swim coaches across Canada. During the 2012-2013 season the CSCTA had over 2800 registered coaches from coast to coast. Our long standing partnership with Swimming Canada requires all coaches working with a Swimming Canada member club or organization to become a member of the CSCTA. We also have a formal partnership with I Can Swim and Coaches of Canada and work closely with the American Swim Coaches Association. We have members from many other swimming organizations not affiliated with these groups. The CSCTA advocates on behalf of swim coaches at all levels and with different organizations. We have a seat on various Swimming Canada committees and currently hold a seat on the Board of Directors for the World Swim Coaches Association.